Bread Machine White Bread: a homemade bread that will replace any store-bought any day. 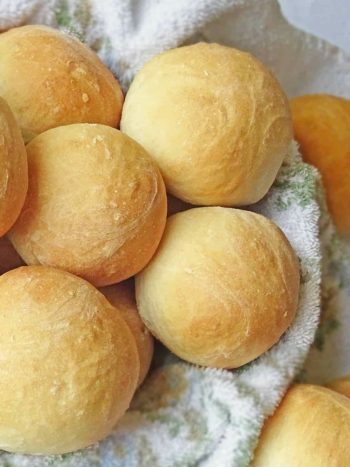 Only 5 ingredients and you will taste the best bread! This recipe of the White Bread Machine Bread is a family recipe we’ve been using for almost two decades. It’s so simple, few common ingredients and the bread is incredible. I remember our guests would always compliment at how delicious our bread is and asking how we make it. If you don’t have a bread machine, I would highly suggest buying one. I would recommend a Panasonic Bread Maker; I bought mine 4 years ago and I use it on an everyday basis to make bread and any dough in bread category; you don’t have to knead it and this bread maker actually rises the bread; it does its magic for you. All you have to do is take out the dough, form the shapes of buns or whatever recipe you’re working on and bake. Use all-purpose flour. 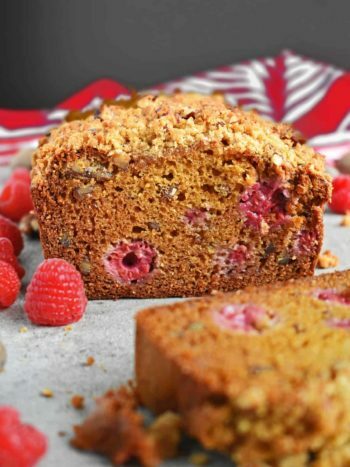 At the moment I’m using Bob’s Red Mill brand all-purpose flour and this is perfect for this recipe. If you run into this situation…when the bread machine starts mixing and you see that the dough is kind of thick and hard, add a bit water to smooth it out. For perfect bread, it should rise a bit higher than the basket in bread machine once it’s baked. 1. Don’t plug in your bread machine just yet. Put 4.5 cups all-purpose flour into the bread machine basket. Then continue adding the rest ingredients: 1 teaspoon salt, 1 tablespoon oil and lastly 1 3/4 cups (410 ml) cold water. Put 1 teaspoon instant yeast into yeast hole. (If your bread machine doesn’t have a separate hole for yeast then just add into the basket with the rest of ingredients). Plug the bread machine in, set to XL (in size), Basic bread and Medium (in color) – this would take 4 hours. 2. When your bread is done, leave it in for 10-15 minutes so that when you take it out, the little butterfly at the bottom of the basket comes off by itself when you flip the bread out. Wrap bread in food wrap and cover with a towel until it cools so that it stays soft. You can slice into pieces and put into Ziploc to refrigerate and enjoy for up to a week. Enjoy!! A homemade bread that will replace any store-bought any day. Only 5 ingredients. Don’t plug in your bread machine yet. Put 4.5 cups all-purpose flour into the bread machine basket. Then continue adding the rest ingredients: 1 teaspoon salt, 1 tablespoon oil and lastly 1 3/4 cups (410 ml) cold water. Put 1 teaspoon instant yeast into yeast hole. (If your bread machine doesn’t have a separate hole for yeast then just add into the basket with the rest of ingredients). Plug the bread machine in, set to XL (in size), Basic bread and Medium (in color) – this would take 4 hours. When your bread is done, leave it in for 10-15 minutes so that when you take it out, the little butterfly at the bottom of the basket comes off by itself when you flip the bread out. Wrap bread in food wrap and cover with a towel until it cools so that it stays soft. You can slice into pieces and put into Ziploc to refrigerate and enjoy for up to a week. Enjoy!! What can be easier than adding few ingredients and pressing the ‘on’ button? 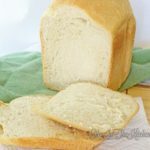 This bread is super tasty, so easy and simple and it definitely replaced all of the bread I used to buy. No sugar! That was the first question I asked mom when I asked her for this recipe 7 years ago. Ukrainians don’t really put sugar into breads unless it’s the sweet buns recipe with some kind of filling. Im making this bread right now and it did not rise a lot, I used around 4 cups of canadian flour, may be 1 tsp of yeast is not enough? From experience, I would do the same steps and measure ingredients same way and one time it’s slightly higher than other times. Mom made this bread for like 20 years and she said it all depends on the flour; the moisture, the brand and other times the bread machine (she has Panasonic now, but had Oster before). The yeast was always 1 tsp, not less or more. 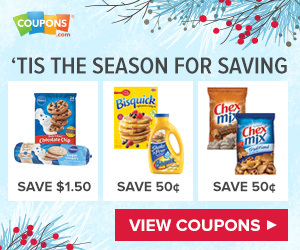 However, I would assume 4 cups of flour is not enough…? Is the dough too soft? We always do 4 1/2 cups all-purpose for Bob’s Red Mill flour or King Arthur, and other brands like Canadian and Gold Medal might require even more. When it starts mixing and you see the dough looks a bit too soft, you can add more. Other times, I do 4 cups of flour ONLY if I do it half whole wheat. 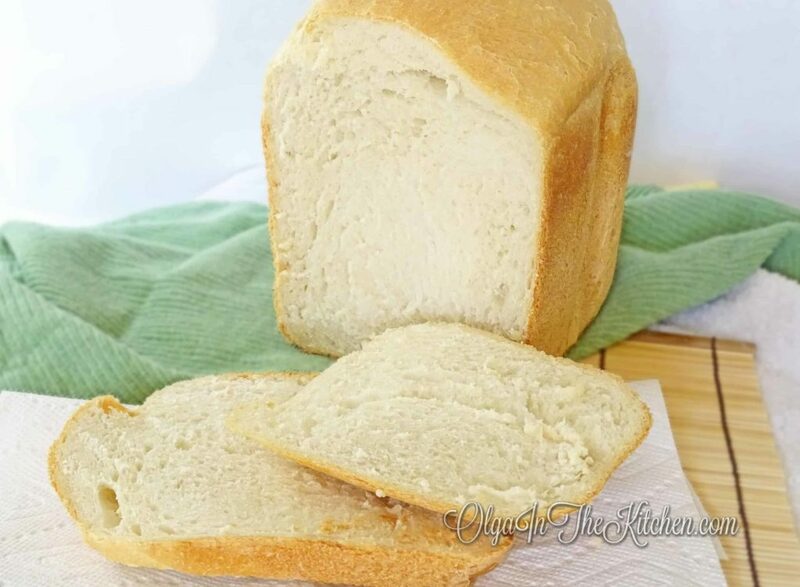 Main thing to remember, even if you add more or less flour, the bread will turn out delicious anyway, just the texture of the bread might be lighter or slightly heavier from more flour. Hope this helps! 🙂 Let me know if you liked it. It’s the #1 bread in our home and I make it at least 2 times per week. It turned out very good, i had a few slices this morning with a butter, apricot jam and a cup of coffee. The next time i want to try with the flour you suggested to see if it will be any difference in taste. Thank you! 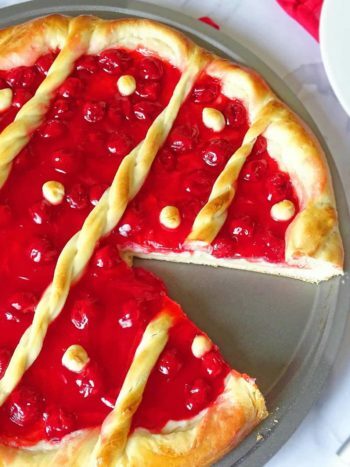 I’m glad you liked it 🙂 The taste will be the same when you use different flour, but the texture and amount of flour most likely will be different. My kids and husband always eat like half of the loaf as soon as it’s out of the bread maker lol Everyone loves fresh and warm bread! We have recently brought a panasonic breadmaker and are trying to find a recipe that works for us. We are a big family so only want to make XL (the biggest bread size setting) loaves. You say in this “set to XL, Basic bread, Medium size – this would take 4 hours.” Im confused, is it an XL sized bread or a medium size? Also interesting the recipes we are currently using have 4 1/2 teaspoons of yeast in them and yours only has 1 teaspoon. Is this a different kind of yeast? Made this bread last night and ate almost the whole loaf. I was surprised that it didn’t have any sugar in it as most breads ask for sugar and the amount of yeast, but this bread turned out perfect. You definitely don’t need any sugar here. The bread was slightly over the bin in size. Perfect again. I used Bob’s Red Mill flour as well and didn’t need to add anymore flour. This is our #1 bread at home from now on. I have to bake it today again. My bread machine was staying in pantry for a while and with this bread, it saves to much time. just 2-3 minutes prep and I do whatever I want around the house while it bakes. Don’t have to keep checking it or kneading. Thanks Olga! Thanks Rose for such a detailed experience/review! 🙂 I think this is why most moms (especially) love this bread because you put everything in and 4 hours later you have fresh bread. So happy to hear you liked it so much! !